Once a year, area foresters have the opportunity to fly over VDOF work areas to check for forest health issues and evaluate herbicide work from the previous summer. We meet planes and pilots from the Virginia Department of Aviation at local airports, provide them with a flying route and then take off down the runway. The hour-long flight covers several counties, so we take a lot of photos to review back at the office. These flights are called “Green Streak Flights” because we are making sure tracts that were aerially sprayed with herbicide received the coverage guaranteed by the contractor. On the Middle Peninsula, the warm, rainy climate and long growing season help clearcut harvests “overpopulate” the land with natural pine and hardwood seedlings, as well as grasses, forbs, and vines. In order to maximize pine growth, research has pointed towards several site preparation options. One option is to spray the tract after its first full growing season with herbicide to control the natural vegetation before planting pines. Basically, spraying a tract and planting genetically improved pine seedlings provides faster growth than would occur if the naturally seeded trees competed with each other for several years to see which ones would win the contest for enough sunshine, water, nutrients and space to survive. We plant loblolly pine seedlings at 484 trees per acre; nature sometimes seeds in clearcuts with 2000 seedlings per acre. It is a lot like planting a garden; you need to prepare the planting site first by removing the weeds, then planting your vegetables. Prior to herbicide treatment, VDOF foresters map all of the tracts that will be treated and provides the aerial spray contractor with a map and Shapefile. The VDOF foresters may also flag hard to see spray boundaries on the ground with white plastic trash bags and colored ribbon. Aerial and ground broadcast spray application performed under VDOF contracts is not allowed within 50 feet of interstates and primary highways; within 50 feet of flowing streams or drainage ditches, or 100 feet of impoundments, except public water supply lakes where no treatment shall be allowed within 500 feet, and trout streams where no treatment shall be allowed within 200 feet; within 300 feet of any residence, store, or other building normally housing people or within 500 feet of any school, hospital, or other public gathering place unless written permission has been obtained. These treatments are also only done during calm days when the wind is less than five miles per hour. In the photo below, some “green streaks” of vegetation that were not sprayed are outlined in red. The aerial spray contractor sent a ground crew with backpack sprayers to cover the areas missed by the helicopter. Here (below) is what a “green streak” looks like on the ground. The next photo shows an active southern pine beetle spot with some dead pines and red-topped dying pines. In this case, we can contact the landowners about harvesting the beetle infestation before it spreads. Our area had received several inches of rain in the weeks prior to our flight on June 6. So, it was no surprise to see standing water in cutovers on flat terrain. Hopefully, the puddles in the photo below will last long enough to provide water to recently planted loblolly pine seedlings without drowning their roots. The photo below shows an area of Dragon Run State Forest that was prescribed burned to prepare the site for planting trees the following spring. From the air, we can see a few small green patches in the cutover that did not burn so well. Burning as a site preparation method provides a quick return of nutrients to the soil and is a less expensive means of removing competing vegetation than herbicide. Burning also provides a mineral seed bed for many grasses and forbs that benefit wildlife. The Green Streaks flights are quick, but provide us with a great deal of information to help us protect and develop healthy, sustainable forest resources for Virginians. Southern end of Gloucester County looking south towards the York River and Yorktown. 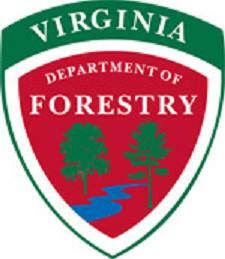 More information on the pine management activities mentioned in this article is available at http://www.dof.virginia.gov/manage/pine/how-to.htm. Next PostBuy It Where You Burn It!